Our home is set in ¼ of an acre on a corner plot. There is 2,349 sq ft of living space. We have 3 bedrooms, the large master suite opens onto the pool via a luxury bathroom. 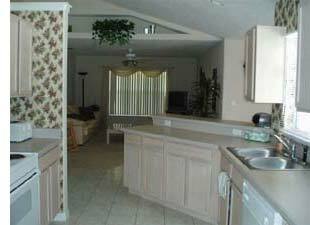 The double and twin rooms share a family bathroom which also leads out to the pool area. 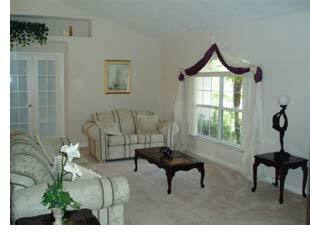 All rooms have walk-in wardrobes and televisions. Large family room with T.V., Video, D.V.D. and C.D. player. Spacious sitting room leading to a family dining area. Fully fitted kitchen with breakfast bar which includes large oven, microwave, dishwasher fridge freezer with automatic ice maker, and waste disposal unit. Telephone offering free local calls. Intercom system providing music to all rooms and pool area. Separate laundry room with a large automatic washer and tumble dryer. Fully screened heated pool with cushioned sun loungers and patio furniture for use on the terrace. Activity room including many family board games, pool toys and a play station console with T.V. Bed linen and towels are provided, however, we do ask that you bring your own towels for the pool area. A private, peaceful, secure and truly lovely setting in which to spend the most memorable holiday.